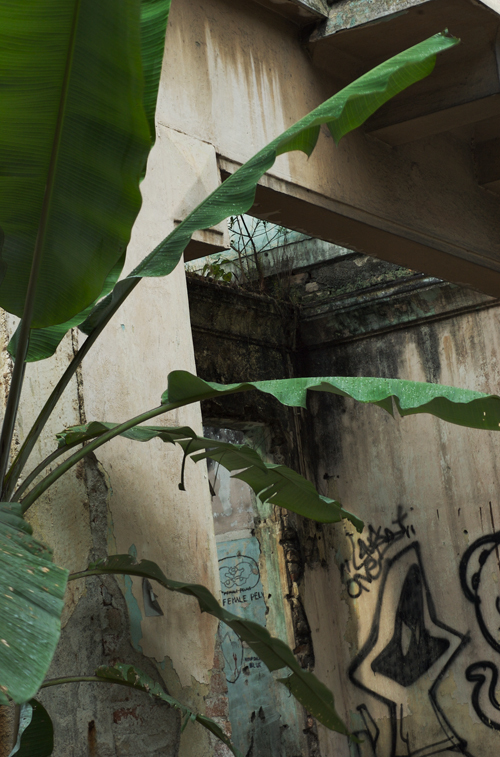 An individual's views of the capital city of a developing Asian country, Malaysia. This is the city that I usually refer to as home. Kuala Lumpur, loosely translated means Mud Valley. Once a mining town, now a holiday destination. Malaysia Boleh! I said it once, I'll say it again, and again, and again. 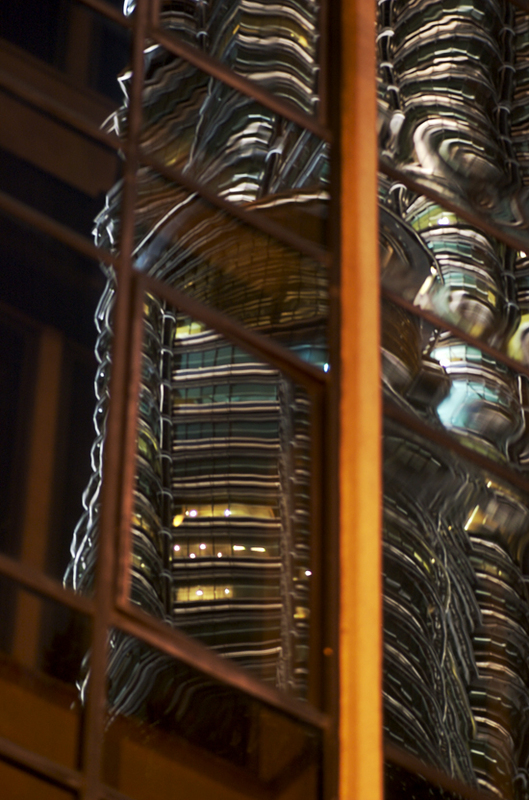 I'll never tire of finding interesting shots of KLCC. 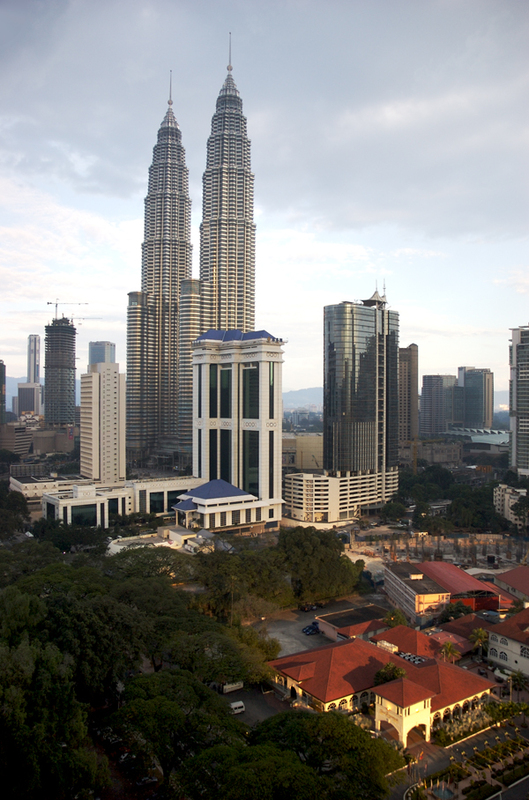 Here's one of the towers and it's neighbour, Maxis Tower. Maxis is one of the biggest cellular communications companies in Malaysia. Maxis is also part of a bigger company that includes Astro (Satellite TV) and, I think, 3 Measat satellites that are currently floating in space. Anyway, must dash off now. To infinity and beyond! would you live in this? 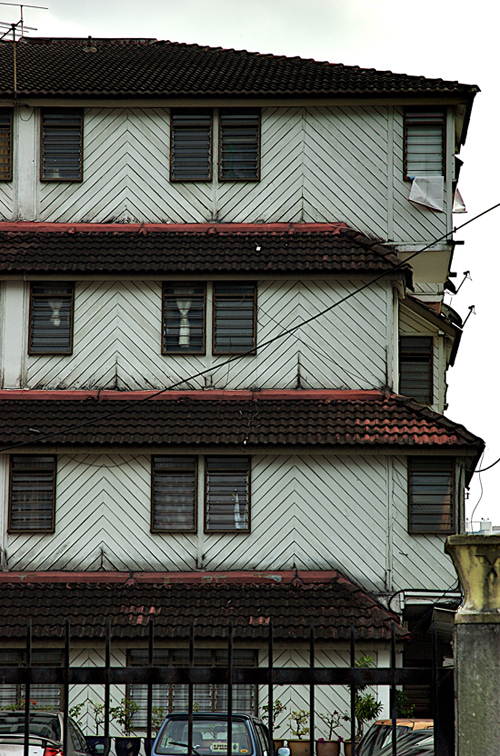 This is just one of many houses in Kampung Baru, right in the heart of KL. 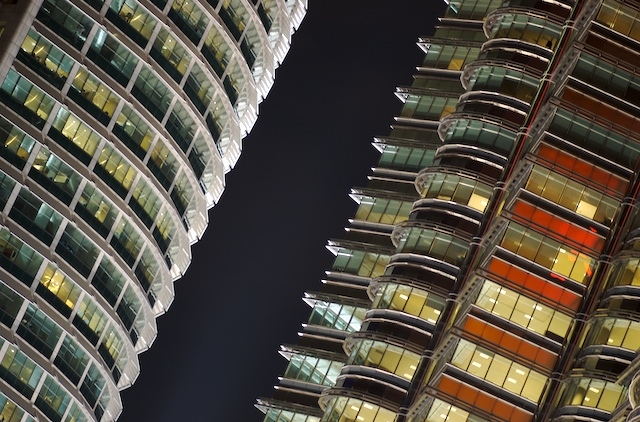 You may consider it a 'high-rise' building, a condominium even. 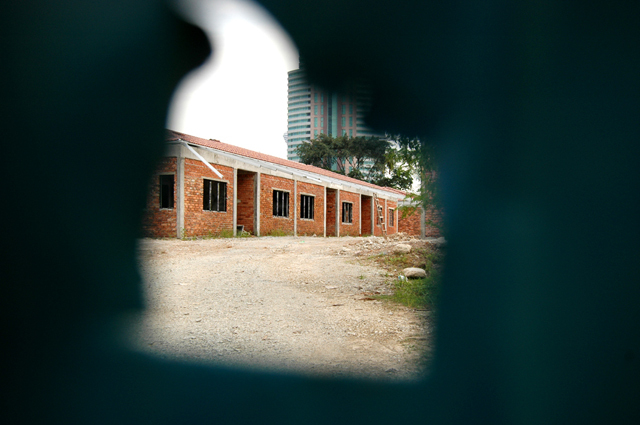 Kampung is the Malay word for village and that is what Kampung Baru looks like. One big village with most of the houses built with wood panels for walls and steel sheets for roofs. It's a Malay community. You won't find any other race in the area. And this is where time moves very slowly. Not much has changed throughout the years. 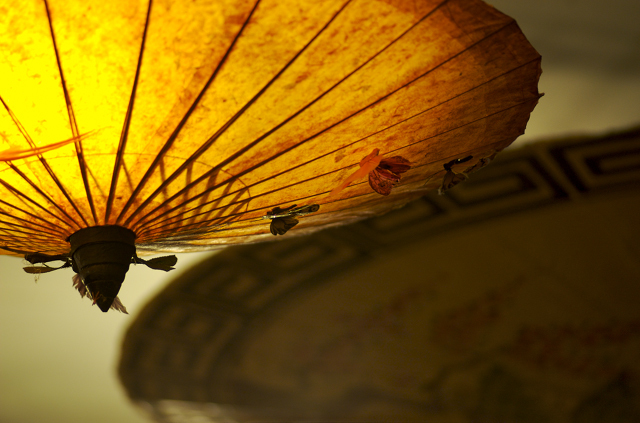 Chinese New Year is a 15 day festival. In these 15 days, friends send baskets of mandarines and cookies and other yummy stuff to each other. The other day, I received a long box of goodies. In it were 2 different kinds of cookies, a lovely raisin fluffy cake and 2 red eggs. I consumed everything until I realised I should've taken a shot of it. I had left the red eggs for last. 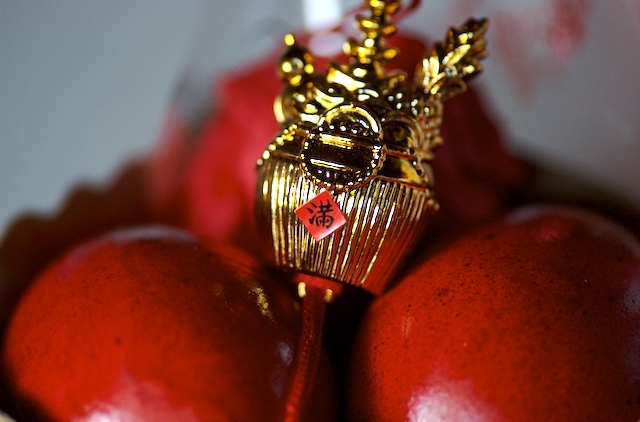 In Chinese culture, eggs symbolise fertility and red is the colour of prosperity. Red eggs are usually consumed at birthdays or weddings. For obvious reasons. So, here are my 2 eggs with a gold nugget resting on top for luck. 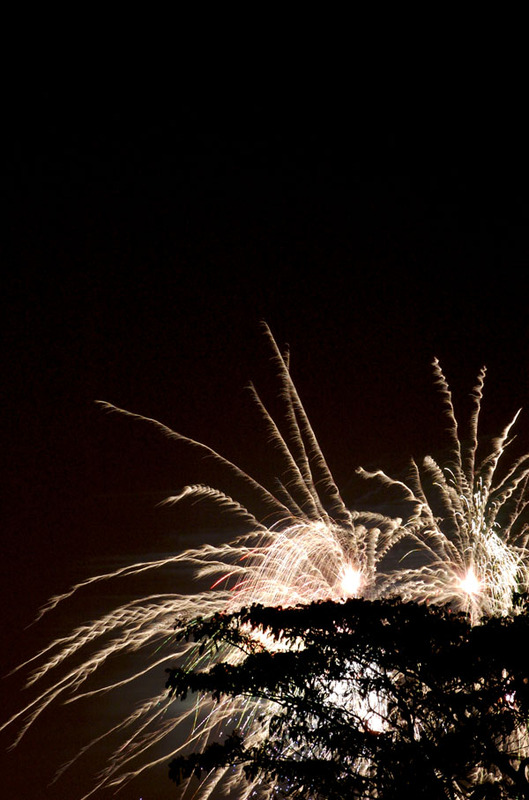 It's been a couple of weeks since my last 'Fireworks in KL' shot. I thought some of you may have been a bit bored seeing fireworks shots every Sunday so I gave it a rest...until today! A quick refresher for KLDP's new visitors: 2007 is Visit Malaysia Year. 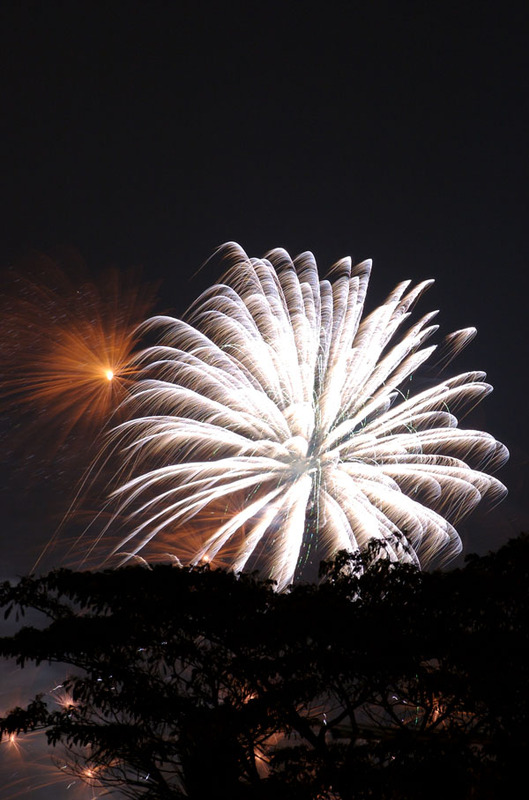 Not too far from where I live is Titiwangsa Lake Gardens, where every weekend, locals and tourists are treated to the Water Sky Extravaganza at the end of which is a 10 minute pyro show. All I have to do is set up my tripod on the roof and snap a shot. Hope you're not too bored with this one. Darkness sets and you can't find your way. In the distance, a shining light guides you home. Hope returns with each step you take. 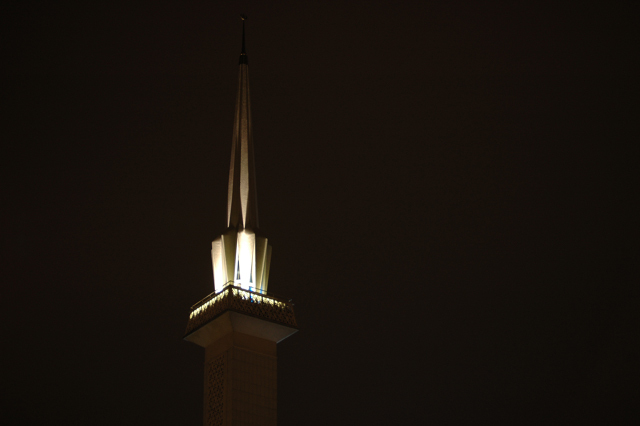 This is the minaret of the National Mosque. Really quite beautiful at night with it's gradient blue-tiled roof and wall-less structure. Superficial perhaps but Islam is a beautiful religion and this mosque helps strengthen that fact. All religions are beautiful if studied carefully. In the wrong hands...well, you know what happens. 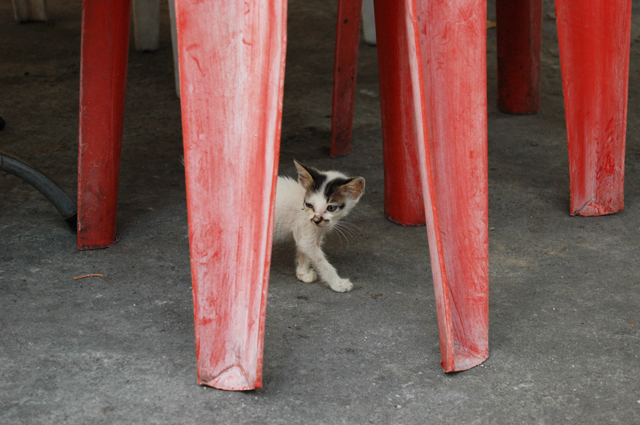 It doesn't matter if the jungle is wet, dry or paved with cement, an animal will hunt when it's hungry. This vicious critter darts between the trees looking, searching for a meal. ROOOAAARRRRR! You better watch out! Here it comes!! Every city will have something like this. Once a beautiful colonial building now ruined. And this happened in less than 20 years. I used to walk past this when I was a young teen and people still lived there. No roof now. And it's only in the last few years that the Heritage Council came about. It's a pity the council didn't come sooner. However, a row of these have been saved and is now named Asian Heritage Row, a strip of bars and restaurants. The interiors are completely modern but the exteriors have been given a good resurrection. No need to imagine what they used to look like. We see it now. Every Chinese business and home will have a place of worship. 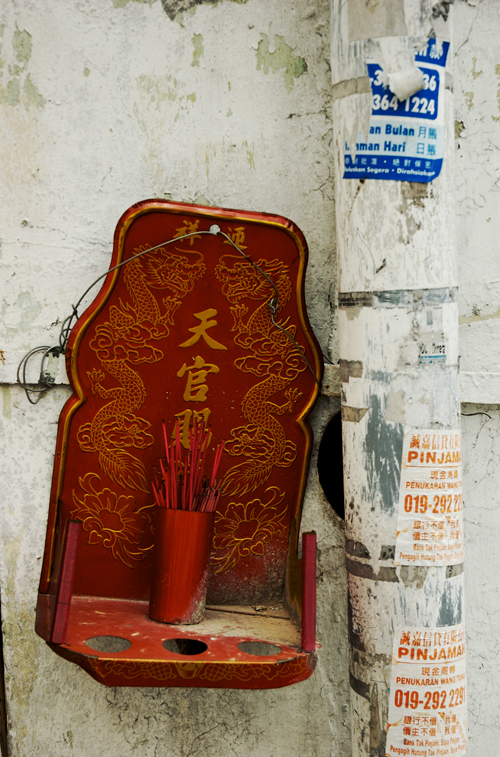 An altar to ask the gods for wealth, protection and prosperity as well as give thanks by simply burning joss sticks. The more elaborate, the better they believe. Some people place fruits and cakes in front of the deities. However, this is a simple one. I found it hanging outside a small unopened store. I guess it doesn't matter how elaborate altars have to be as long as our prayers are answered. No prizes for guessing the building reflected here. All I can say is how inspiring it is for a piccie-taker like me to capture this amazing building. Just when I thought I was done, another shot crops up. KLCC truly is remarkable. Hope you like his one. Something out of Riddick, don't you think? Have you ever wanted to see behind the iron walls that cover construction sites? I have. I was lucky enough to come across this little peephole. Someone must've been more curious than me and made a hole through the iron. I pressed my lens to it and took the shot. I then looked for the sign that revealed the purpose of this site. It's being built for the hospital staff of the National Heart Institute. Can't wait to see the completed project. Happy Chinese New Year! The dog is out and the golden pig is in! To all my DP friends and global bloggers, I wish you a year of happiness and prosperity. Let's grab that pig and give it a great big hug. 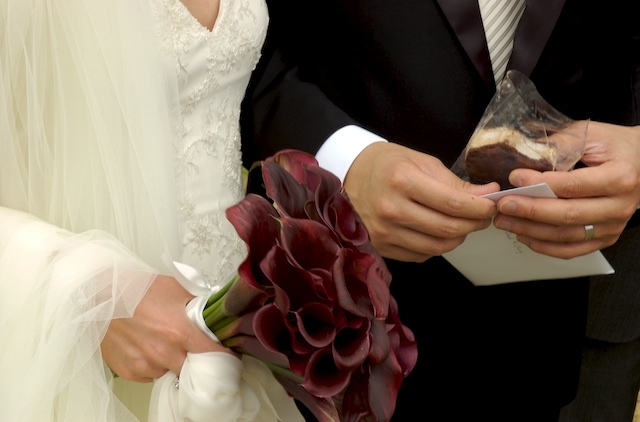 Lisi, Kris, Keropok and Ming, have a wonderful celebration! And to top it off, I found out today KLDP is in the finals for the 2007 Photobloggies! Thanks to everyone who voted. Congrats go to Nathalie, Pod, Lisi, Santy, Bluey, Macky, Rudy and Karine who made it too. Once again, Kong Hei Fatt Choy! 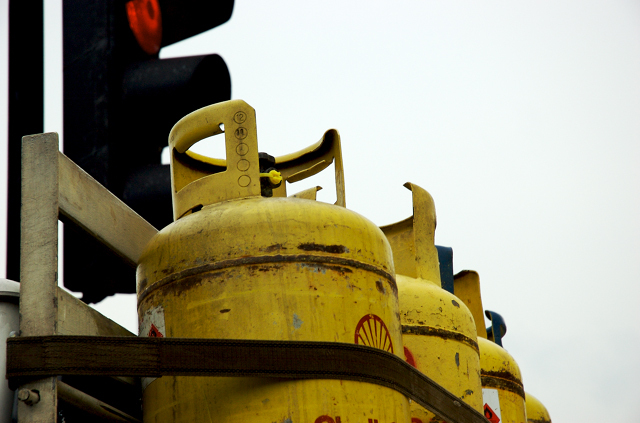 As popular as electric ovens are, many of us still use gas. Here's a truck doing a delivery of gas tongs. 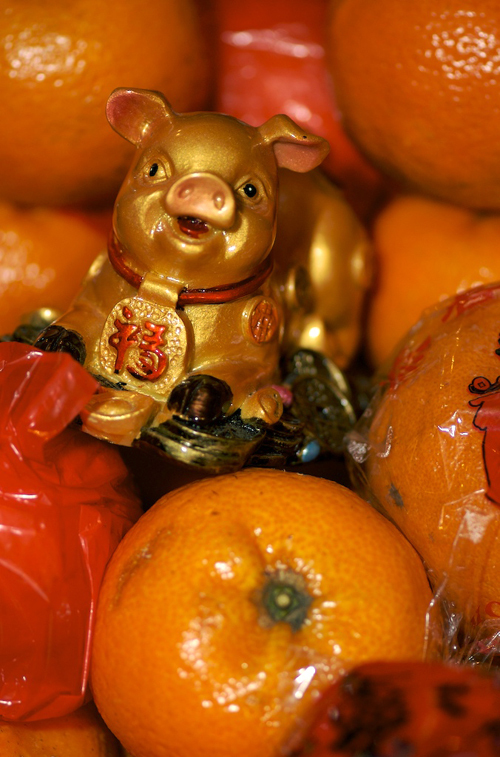 Today is the eve of Chinese New Year. Families will be getting together for the annual reunion dinner. Kids will be running around the garden and tormenting the pets. Adults will be stuffing their faces and comparing the dishes to last year's selection. Teenagers will be texting on their handphones. Eventually little red packets stuffed with money will be handed out. The teens will run to get them and just as quickly, run back to their handphones. The adults will continue to eat. Good homecooked food. All gas ovens. Another picture with yellow as the focus. I've been chancing across a lot of yellow lately. Anyway, these yellow umbrellas are light fixtures at Headline, the hair salon my friends go to. The owner and head-stylist Thomas is Thai and decorated the entire salon to look like a buddhist sanctuary. Really quite pleasant. Buddha busts, lanterns and teak furniture. And he hires the cutest boys. The tea's good too! ps. my home broadband connection is out of service. bugger! 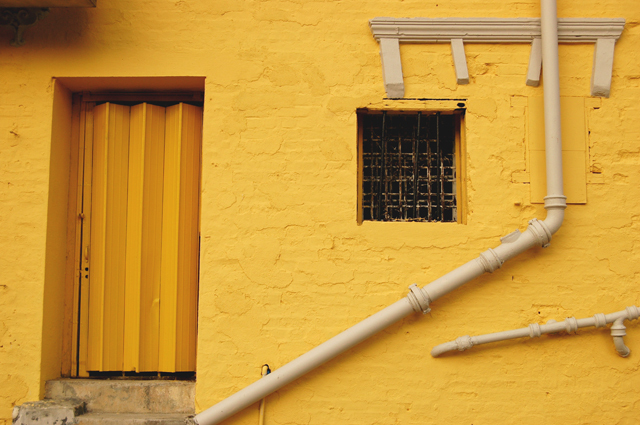 Yellow is the colour of sunray. I remember that line of lyric from the classic Soul II Soul song, Back 2 Life. It's an attractive, warm, happy colour. And I love it. So, it was great for me to have found this wall across the bridge from Central Market. I took just the one shot and walked away happy. The sun sets and people rush home from work to have dinner with their families. The yellow hues of the sun makes way for the tender caress of night. But before that happens, it shows off it's most gorgeous colours before moving to another part of the world. I love that last hour right before twilight. Which do you prefer: Sunrise or Sunset? Some of you will know I was in Sydney recently to celebrate the marriage of my friend Cheng to her man, Khanh. I couldn't post any shots here cos this is KLDP, KL shots only. However, the wedding party returned to KL and we had the big family reception last night. We had a fantastic night out! I was, of course, completely tipsy but still conscious enough to snap this shot to share with you. To Cheng and Khanh, I said it once and I'm saying it again: May love, patience and understanding never leave you. YAMMMMMM SENGGGGGG!!!!! ps. if you wish to peruse the photos from the Sydney chapter of their wedding, go here and click on the C&K album. Another Sunday, another fireworks picture. Whaddaya think of this one? I see a giant spider crawling over a bush. Till tomorrow comes. Have a great Sunday. First off, I must admit this shot was taken last year. Backstage when we were performing 'Second Link' in KL. This is my very good friend Karen Tan, probably the craziest, most hard-working, mother of two gorgeous girls, Singaporean actor. There have been tons of pictures of her but I doubt there's one with her smiling so happily. She reminds me everyday of how she misses KL. Hopefully, this will bring about a slew of memories and tide her over until her next visit this April. Thank you. Now, go vote (only 5 days left) and when you're done, have yourself a wonderful weekend. 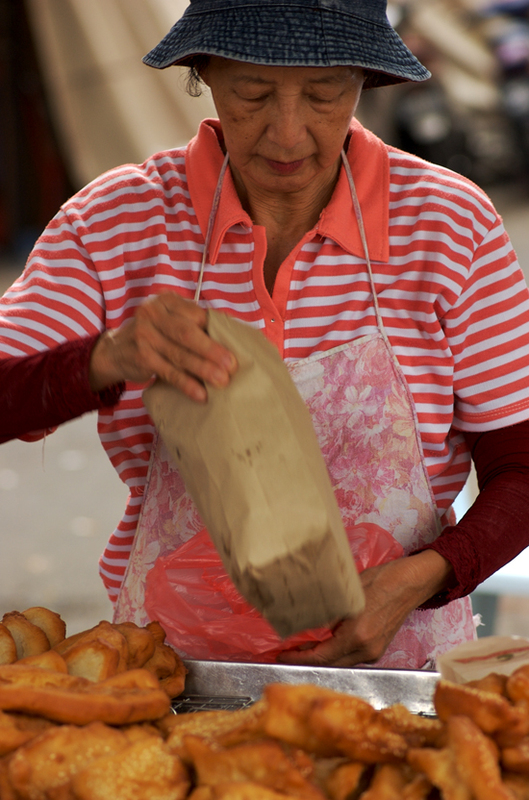 Yau Char Kway, a deep fried pastry of Chinese origin. Made of flour, and a spinkle of rice flour to make it crunchy. They come in several variations. Plain, wrapped with glutinous rice, cinnamon-centered or sugared sesame seeds. Butterfly-, round-, oval-shaped and is a typical breakfast choice. Fried in a huge vat of fat. Eaten as is or dipped in thick, black coffee. 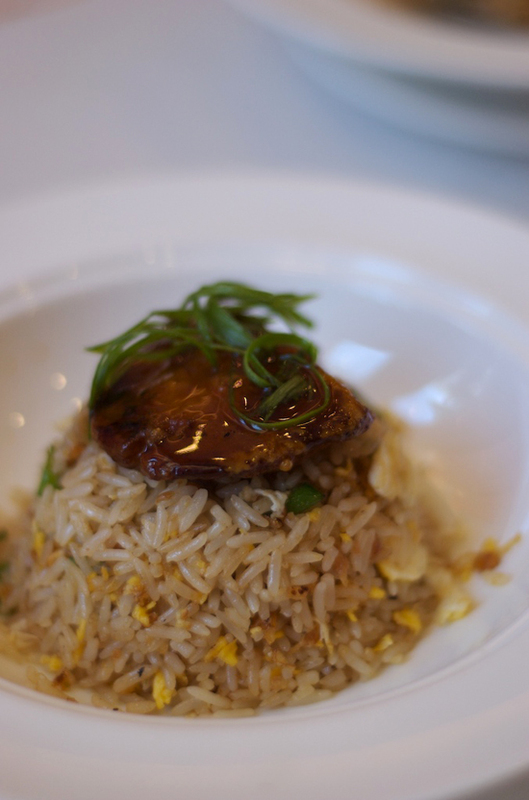 In Dim Sum parlours, it is sliced thinly, re-fried and sprinkled over porridge. Damn it, this post is making me very hungry. A view of of my little world reflected off a shiny globe. When you take a walk in KLCC park, there's a bridge you can cross and it's lined by these silver globes. I don't know what possessed me but I had to take a shot. For just the slightest moment, I felt like a fortune-teller looking into the future. Que Sera Sera, whatever will be, will be. The KL sky is once again clear and ablaze with the hot sun. Perfect for the amateur photographer like me. Colours are brigther, details are sharper. Any shot I take in the day comes out beautifully. After months of dreary weather, I'm out prancing like a child again. And what better place to get a shot than at the park, eh? Gave myself a project to only shot at the playground. Perfect for the child in me. I wanted to play on the swings but alas, my derriére didn't allow it. 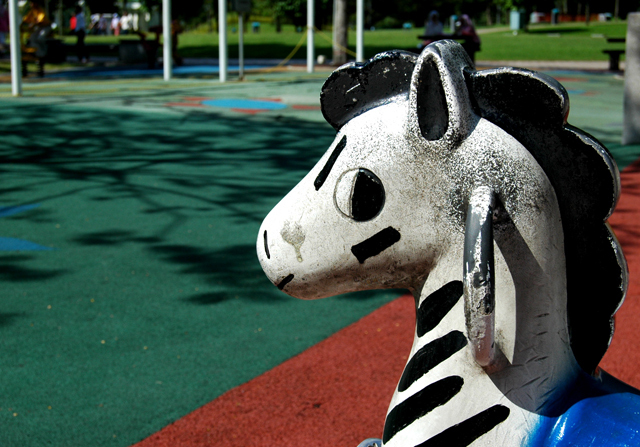 I did sit on this zebra rocker though. Fun. In the papers today, it was announced that floods were no longer a threat but warned that we now may experience a drought. Oh dear. It does get very hot here. And we have a lot of forests. Fire. Clear skies at a price. I'm getting in my bathtub now thanks. Haven's posted a night shot for months, so here's one I cropped from a larger shot. 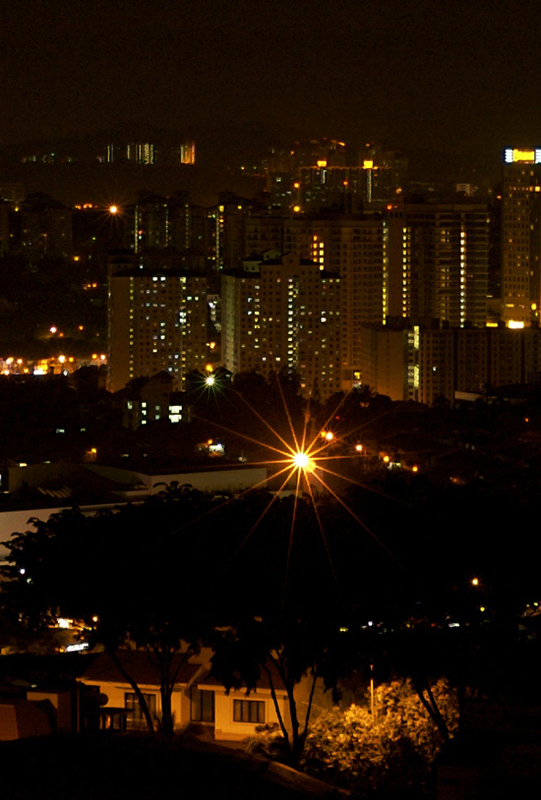 This is Bangsar, one of KL's suburbs. A long, long, long time ago, when princesses still kissed frogs, Bangsar was a lovely little residential area. Then one day, bars and restaurants started appearing much to the chargrin of the villagers. Now, finding a space to park when you get home has become a survival of the fittest. My friends and me refer to it as the Soho of our city. One consolation for the residents, a huge shopping mall called Bangsar Village which stands proud right in the center of it all. 2 days ago I posted the lion heads and mentioned the blokes who were standing around. Here they are. What I forgot to mention was how hairy their legs were. I tell you some men know absolutely nothing about personal grooming. It's Monday and another week begins. 2007 seems to be moving really quickly. Well, doesn't matter as long as we accomplish what we set out to do. I've taken 2 dormant blogs and gave them a fresh new start. Vision 20/20 will now accompany KLDP as it's younger-better-looking brother with photos outside of the KL theme. I've only posted one shot to annouce it's birth so come visit when I've found it's breath. Now, it's off into the city to discover more sights to share with you. Stay stunning and fresh everyone. 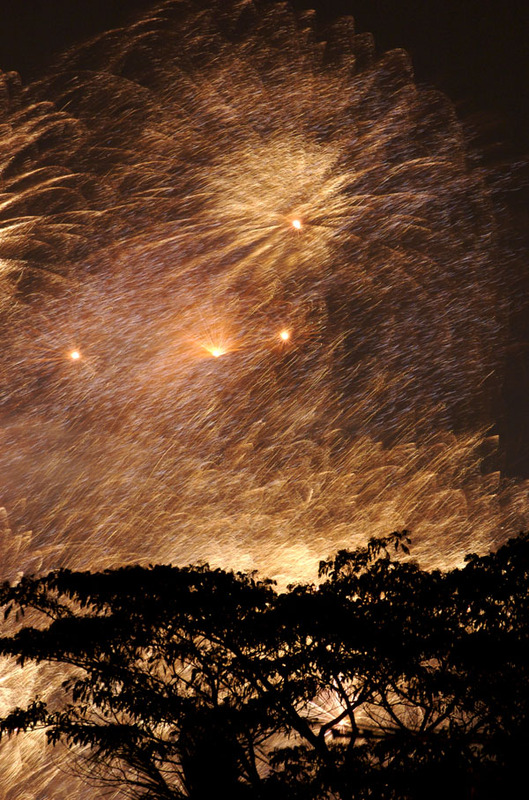 It's Sunday and it's time for fireworks in KL. Just a quick refresher for the new visitors of KLDP: Every Sunday, I post a shot of fireworks because I see fireworks everynight from the roof of my house. It's Visit Malaysia Year. Here's something different from the last few fireworks pictures. When these fly into the sky, they explode like fairy-dust and I did my best to capture the moment when the sky was filled with gold dust. It's been a month and I'm not tired. It's good to feel like a child everynight gazing in wonderment. 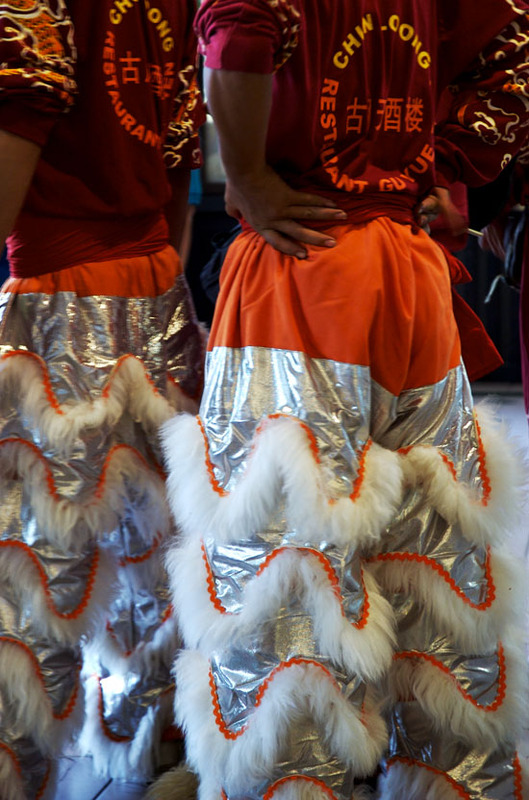 You know Chinese New Year is close when the lion dancing troupes turn up at shopping malls. I saw these lion heads when I went out to pick up my laptop. 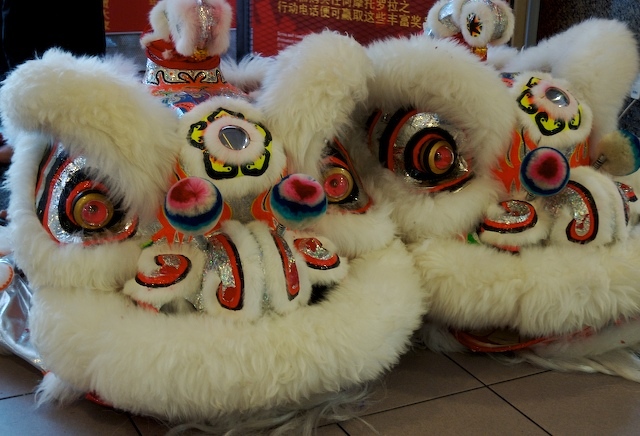 It's believed that inviting a dancing lion into your store/office/house scares away bad chi and encourages prosperity to come in. A couple of blokes put on the lion and jump about on stilts and stuff while accompanied by the sound of drums. I wanted to catch them in action. However, after waiting for ten minutes, I buggered off cos nothing happened. The heads remained on the ground and the blokes just stood around. As blokes usually do. ps. the first batch of 18 photos from my trip have been uploaded to Flickr. go on then. After 8 days of sun, sea and surf, I return to the drone of the city. I've uploaded the pictures I took and it looks like I don't have to tweak them in PS. The colours in Syndey are so pure (must be that hole in the sky). You'll soon see them on my Flickr page once I've sorted the lot. So, now we get back to KL programming. I took this one before I left. Remember the Eye on Malaysia? It stands in the middle of a man-made lake and around it are these buoys. 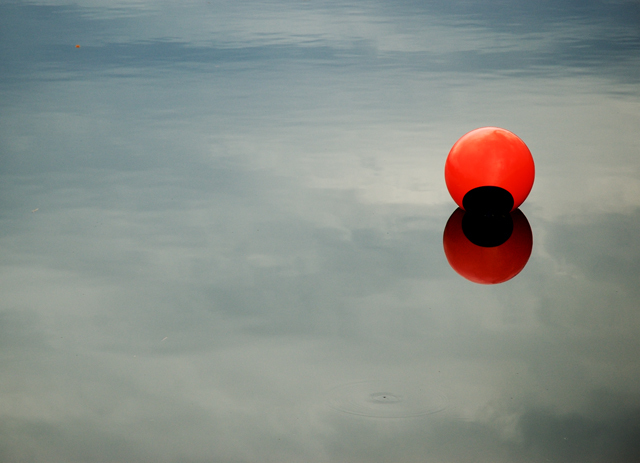 I like the reflection of the sky on the water and the buoy looks like it's floating between sky and water. Kinda how I'm feeling at the moment. Just floating. ps. take a gander at the wedding reception food shots by The Ravenous Rabbit. 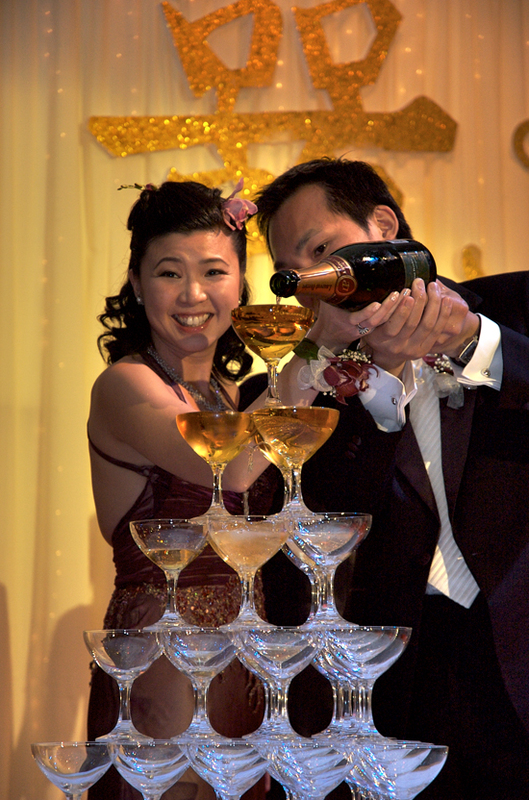 The closing shot has us screaming a traditional Chinese toast to the bridal couple. I must say I look extremely dashing. I'm back! I'm sure you won't mind my posting this shot from the wedding in Sydney. The sun, the surf, the food, the love between two people and for the first time in years, the tears of joy when you see a friend marry for all the right reasons. This trip had so many wonderful moments. I have to thank Pod for the views and Nathalie for a great end to a fabulous holiday. I didn't meet Sally because I was distracted by a piercing sun and crashing cool waters of Manly beach. I liked Sydney a lot but I was ready to give up on it. However, meeting two complete strangers changed all that. Pod showed me the beauty of the ocean and Nathalie showed me the beauty of the heart. Even Sally's text messages played a part. I also got to know my friends a little better. It's funny how after 20 years of friendship, we still discover things about each other. Candice, some things are better left unsaid but I'll say it anyway...innit? Cheng and Khanh, may love, patience and understanding never leave you. Like the Adidas t-shirt I saw that read, "I Love Sydney." I have nicknamed the city Syndey. This is a Flickr badge showing public photos from discoquette. Make your own badge here. KLDP and many City Daily Photo blogs were nominated for the 2007 Photobloggies!